Craig and Caroline Valentine have been operating Camai Bed and Breakfast, since May 1981: we are in our 35th year as a green lodging option! We invite you to enjoy the comforts of our inn accommodations during your Anchorage, Alaska vacation. The Valentines have lived in Alaska for more than 40 years. Their two children, who no longer live at home, grew up helping with the bed and breakfast. Their daughter Cecilia, her husband, and three children live in the Seattle area. Cecilia worked as an engineer until she and her husband had children. She is now a full-time wife and mother. Their son, Kit, and his wife live in Anchorage. Kit is a civil engineer, a P.E. He and his wife have four beagles. Craig and Caroline are active in their church. 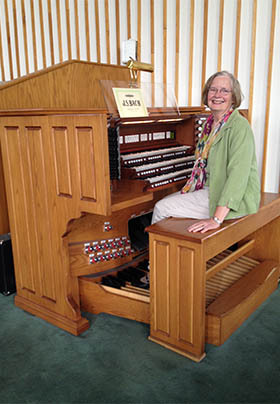 Caroline serves as both her church’s organist and their handbell director. She is a member of American Guild of Organists and Handbell Musicians of America. 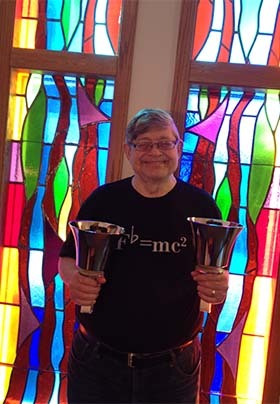 Craig is a faithful handbell ringer in the church choir. Craig is a retired civil engineer. He has a special interest in keeping Anchorage’s streams clean, specifically Chester Creek which runs through the B&B’s backyard; in that capacity, Craig has served on the board of Anchorage Waterways Council. Craig served as Vice President and President of his Community Council. He is Vice Committee Chair on the Cook Inlet Regional Citizens Advisory Council. Caroline is a retired public school mathematics teacher. She is now a math adjunct at University of Alaska Anchorage. After many sedentary years, Craig and Caroline trained to walk a half marathon. In August 2008 they completed the Skinny Raven Half Marathon. In 2009 they both completed the Mayor’s Half Marathon. Caroline and her daughter completed a November 2009 half marathon in Seattle. In August 2010 Craig and Caroline completed the Skinny Raven Half Marathon. Caroline walked her first marathon in June 2011 and completed her second (and final) marathon in June 2014. Summer 2013 she completed two more half marathons. After a knee replacement late summer 2015, Caroline began training in January 2016 for the Trent-Waldron Glacier Half-Marathon held in May 2016 in Anchorage. In the summer, both Craig and Caroline enjoy working in their fragrant rose garden. Caroline was in the first Master Gardener class in Anchorage, helping their garden win awards throughout the years. Craig and Caroline are active in the Anchorage Alaska Bed and Breakfast Association (AABBA) and the Bed and Breakfast Association of Alaska (BBAA). Craig has served terms as president and treasurer of AABBA. Caroline has served as president, vice-president, and treasurer of AABBA as well as vice-president and secretary of BBAA. Offering green lodging in Anchorage, Alaska, Camai Bed and Breakfast is a Green Star award winner. Camai Bed and Breakfast continues to work toward three “Green” goals of becoming an environmentally friendly bed and breakfast by significantly reducing solid waste disposal by recycling aluminum cans, plastics, mixed paper, and glass; and reusing products. We encourage our employees to use alternative transportation such as walking, bicycling, and riding the city bus. We provide the website link for the city bus to guests. At breakfast, guests are treated to organic fair-trade coffee and cocoas. Caroline works to educate other members of the Anchorage Alaska Bed and Breakfast Association to take actions to lessen the impact on the beauty of Anchorage and Alaska. With other Anchorage Alaska Bed and Breakfast Association board members, she implemented the association’s “Going Green” Program.